Good Morning, Happy Hump Day! Before we go any further, I neeed to go over my dinner from last night because it was so easy, tasty, and one of my favorite fast meals. 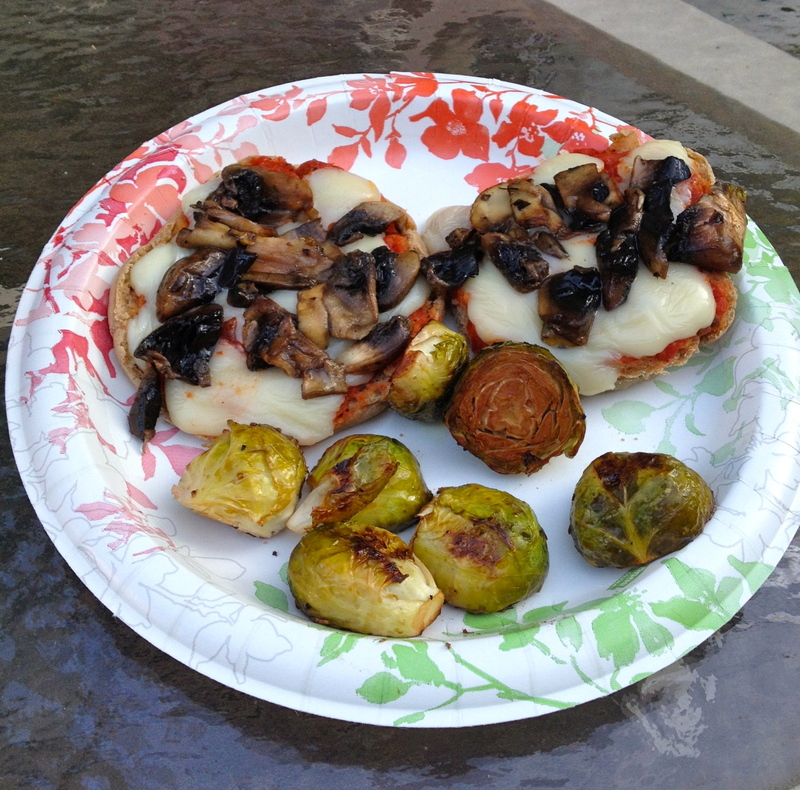 English Muffin Pizza and roasted brussel sprouts. I was craving pizza last night and refused to eat the single pizza pans my Mom buys for my brother, so I turned to my favorite alternative pizza dinner :). It’s not quite as delicious as a melty, cheesy, greasy, piece of pizza, but it’s almost that good. Plus I am not left with an uncomfortably full tummy at the end of this meal. 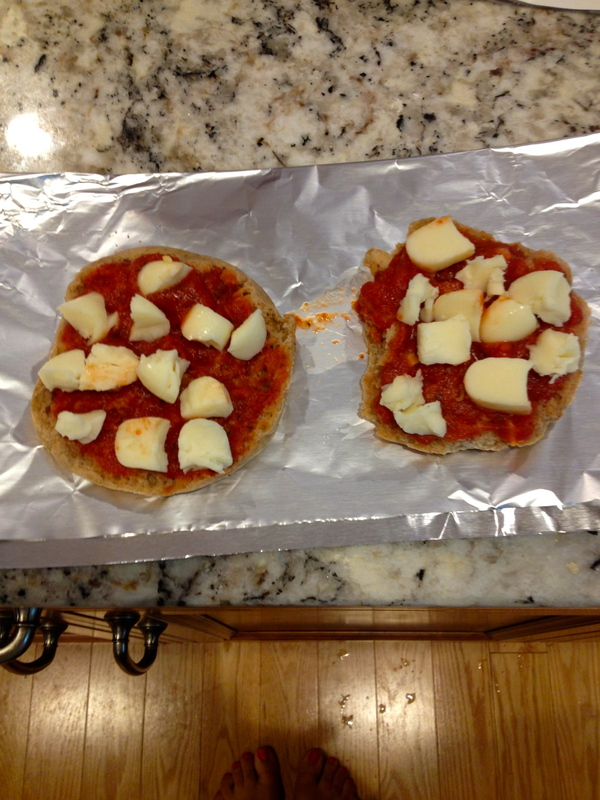 My english muffin pizza is perfectly satisfying! I started by roasting the brussel-sprouts, to do this I preheated the oven to 400, cut them all in 1/2, placed them on a tin foil lined baking sheet, added a little bit of olive oil, balsamic dressing, salt/pepper, and stuck them in the oven for 20 minutes! (Amy gave me these directions). 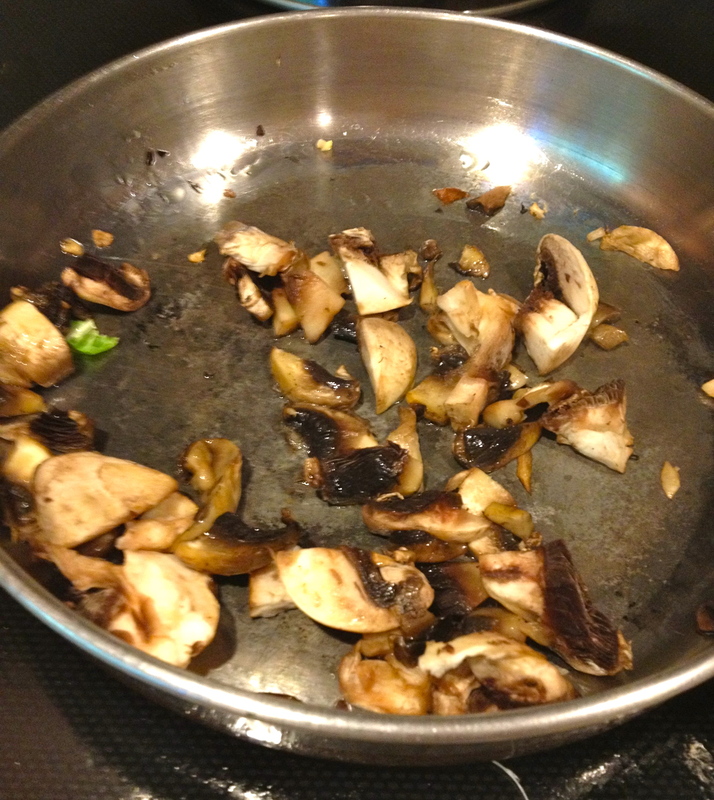 I first sautéed the mushrooms. And, then stuck the pizza with the sauce and cheese on it, on top of a sheet of tin foil and toasted it in the already preheated oven (from the brussel-sprouts). It was ready in about 5 minutes. I took it out, added the mushrooms, and enjoyed. This meal definitely fulfilled my pizza craving. After I ate this Amy and I watched So you Think You Can Dance, and it was Vegas week. Fiction shocked me once again! He’s too good. I’m off to go to the gym and then my best friend’s pool, I’ll be back with another post later today. Have a great day. Oh, btw- I added a Who’s Who Page to keep everyone straight on the people that are going to pop up on my blog :). Do any of you watch So You Think You Can Dance? If so, whose your favorite so far? !